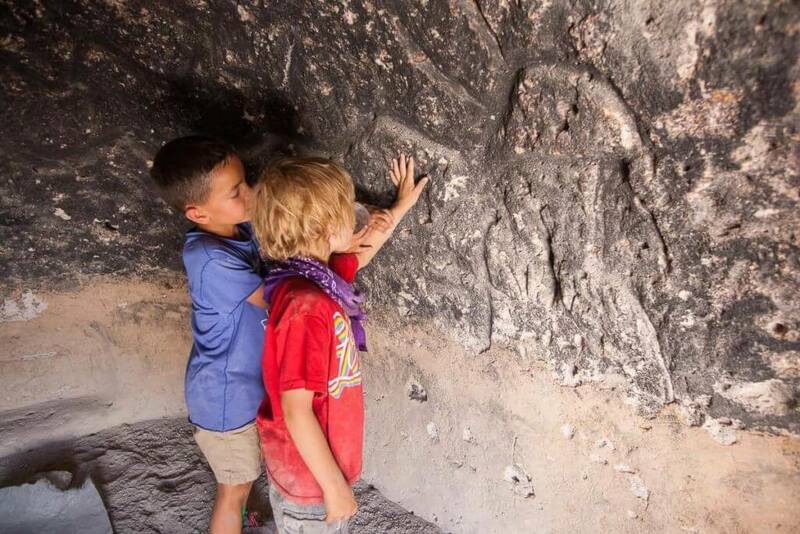 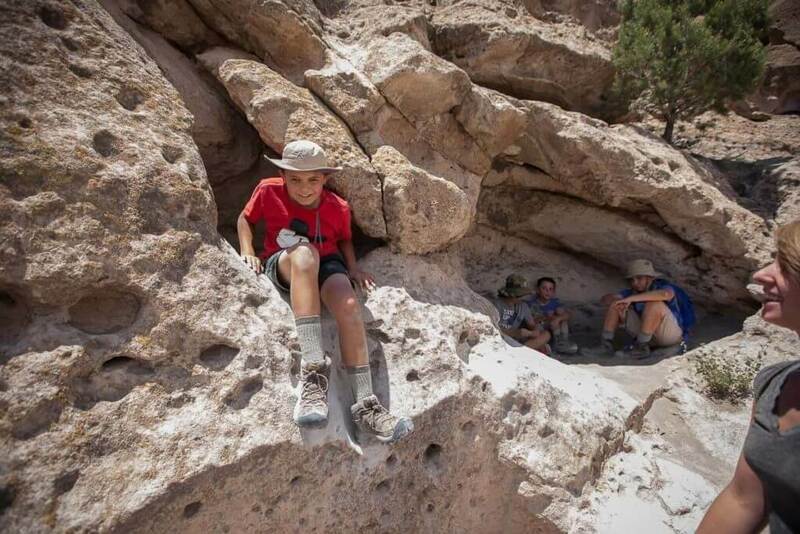 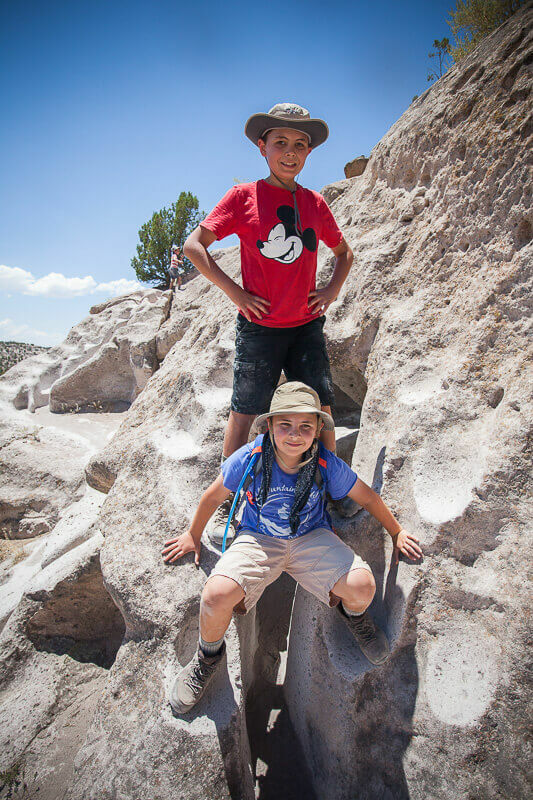 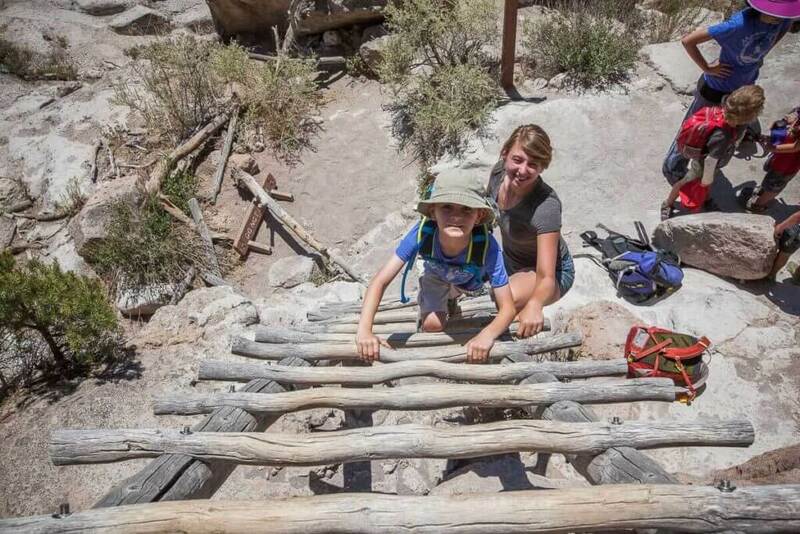 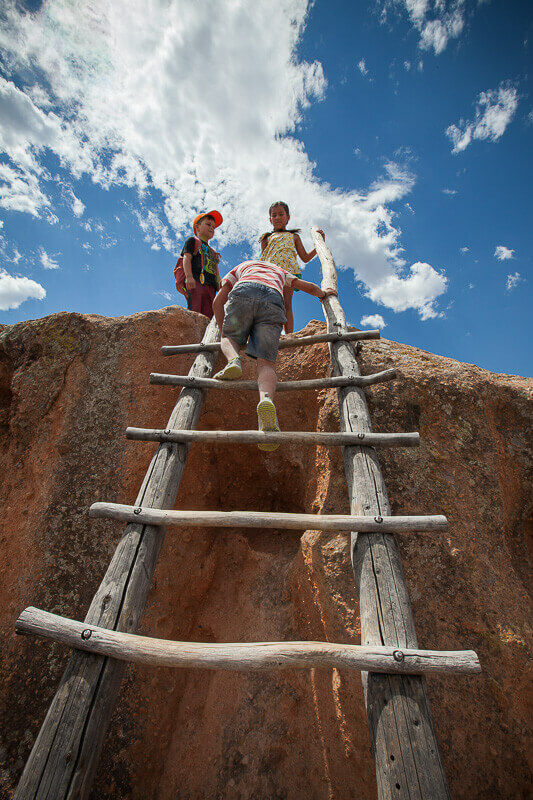 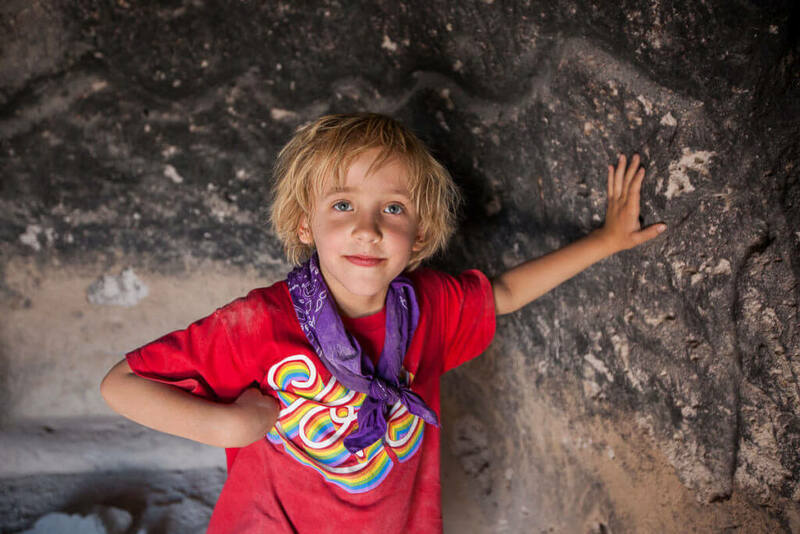 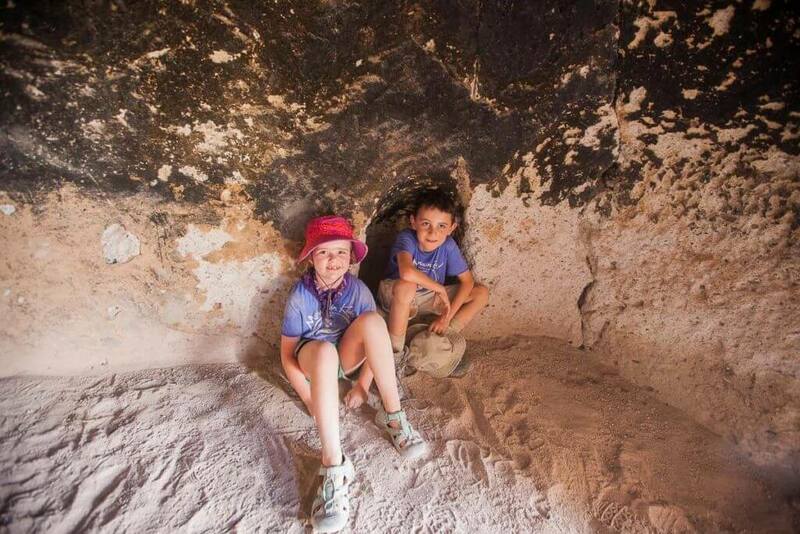 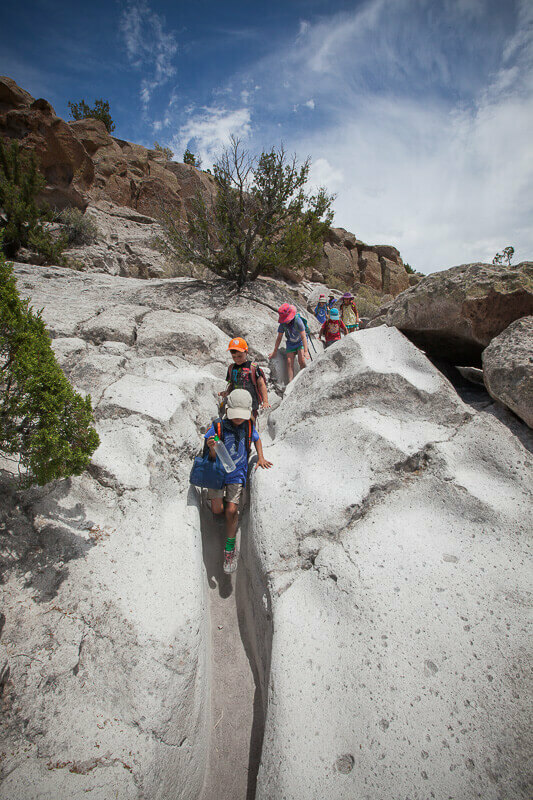 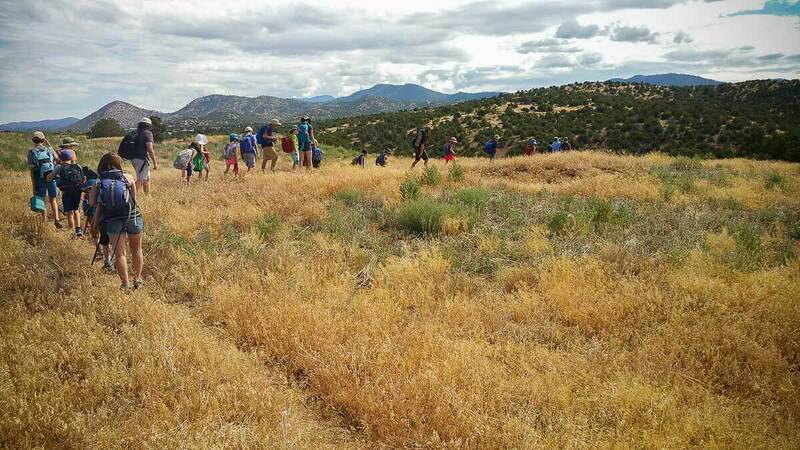 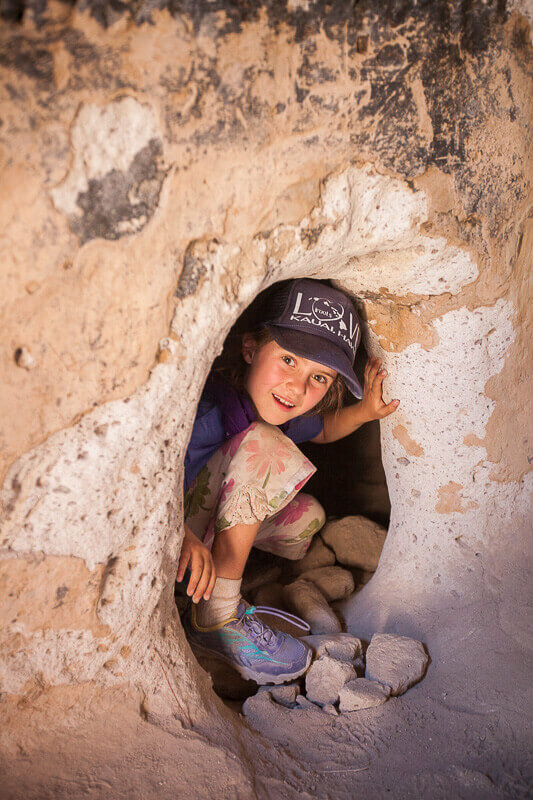 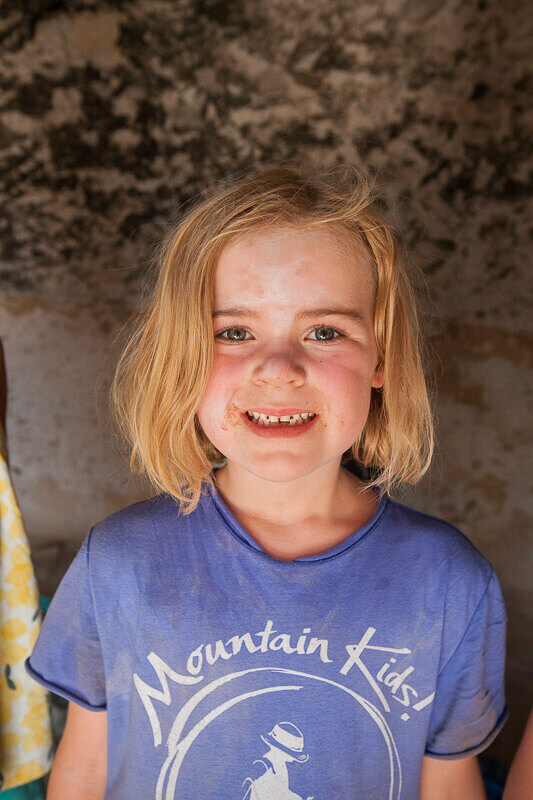 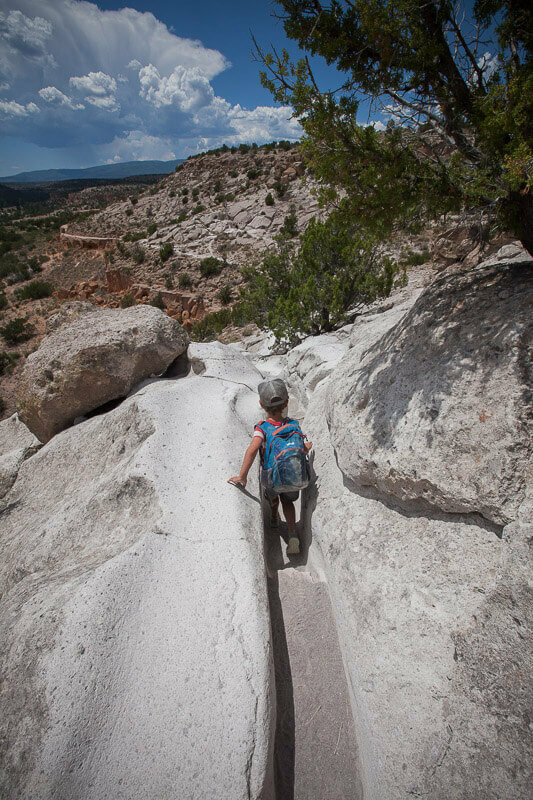 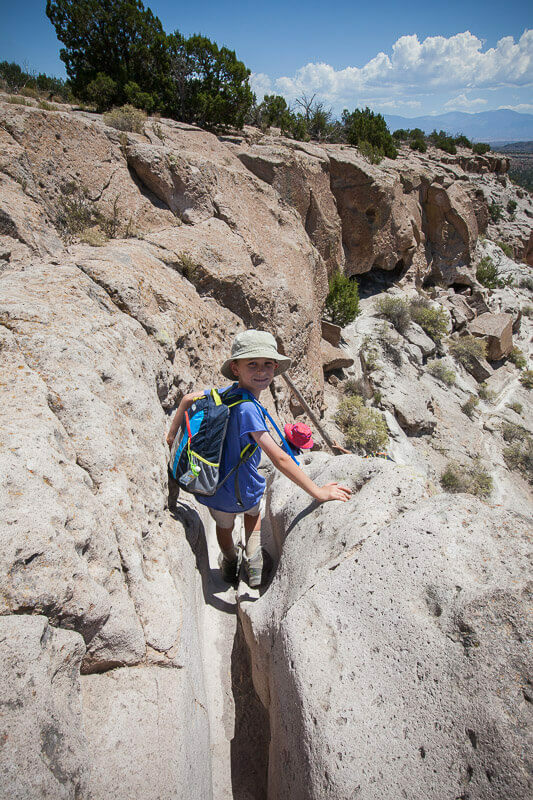 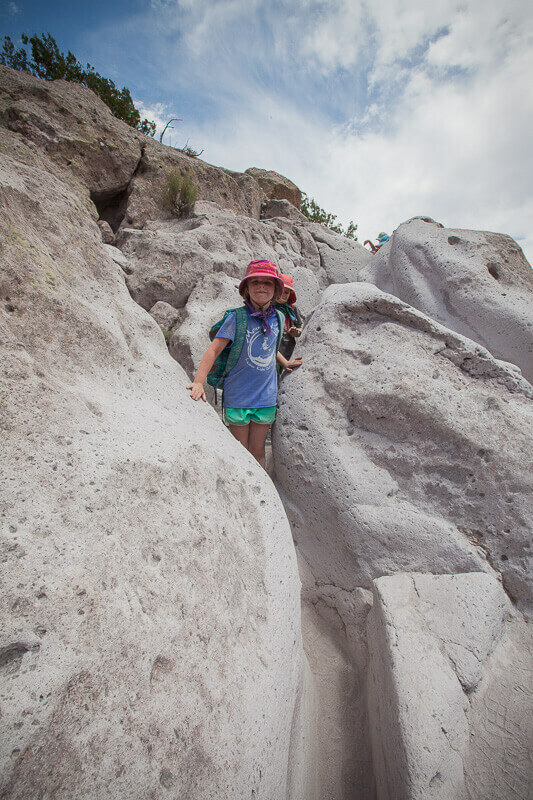 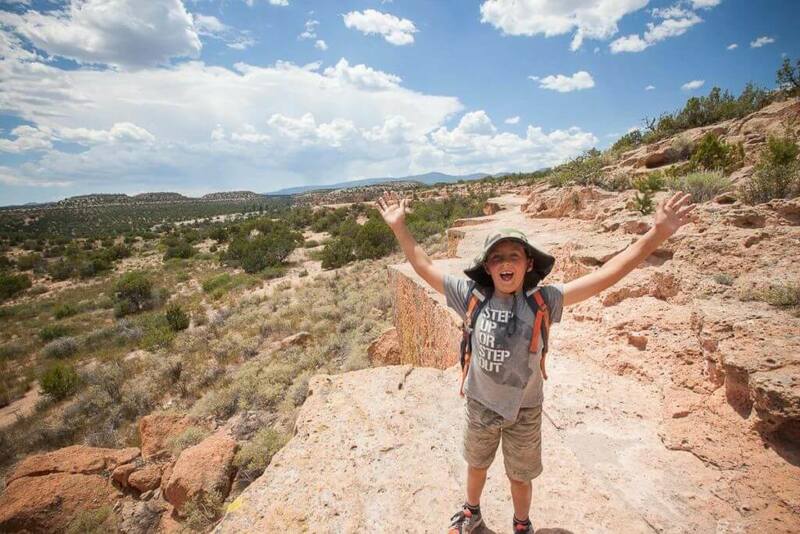 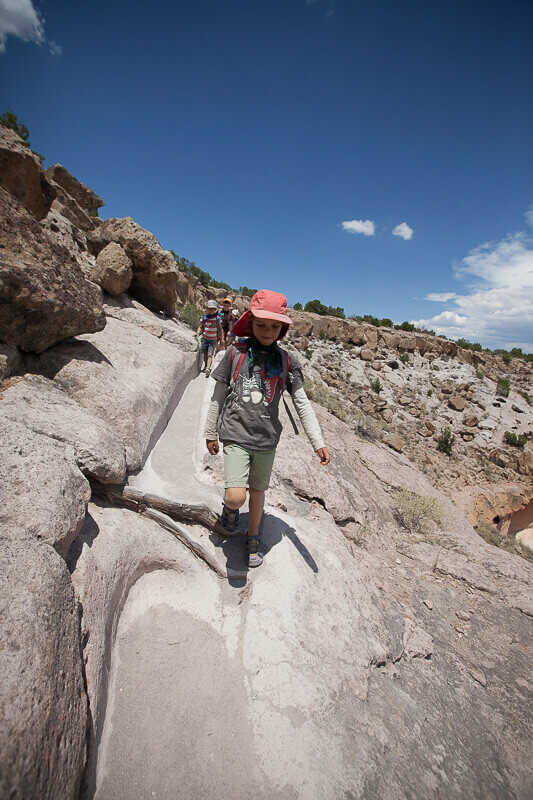 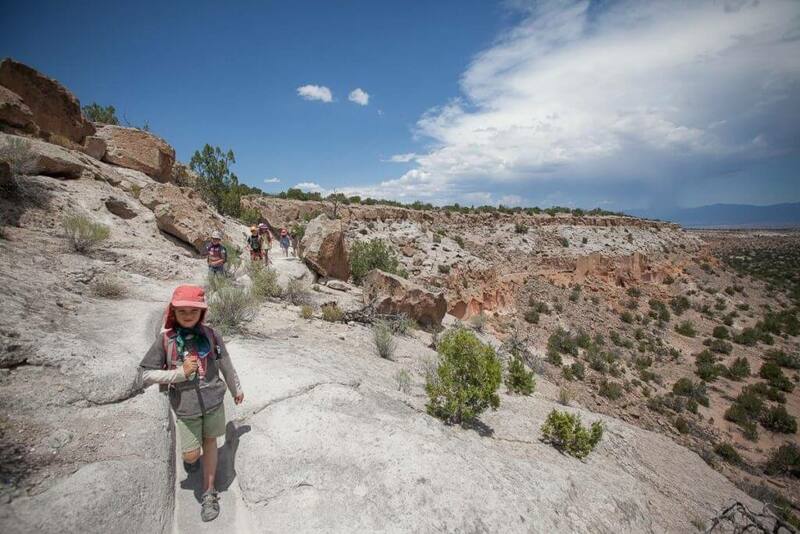 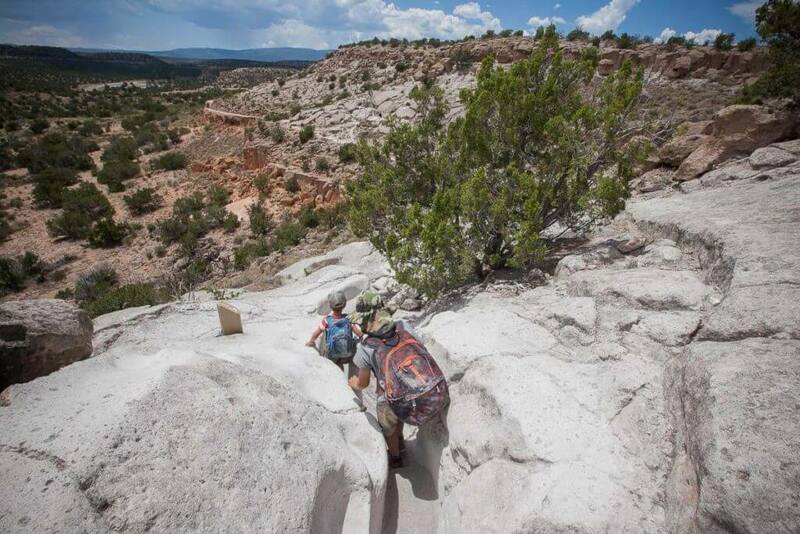 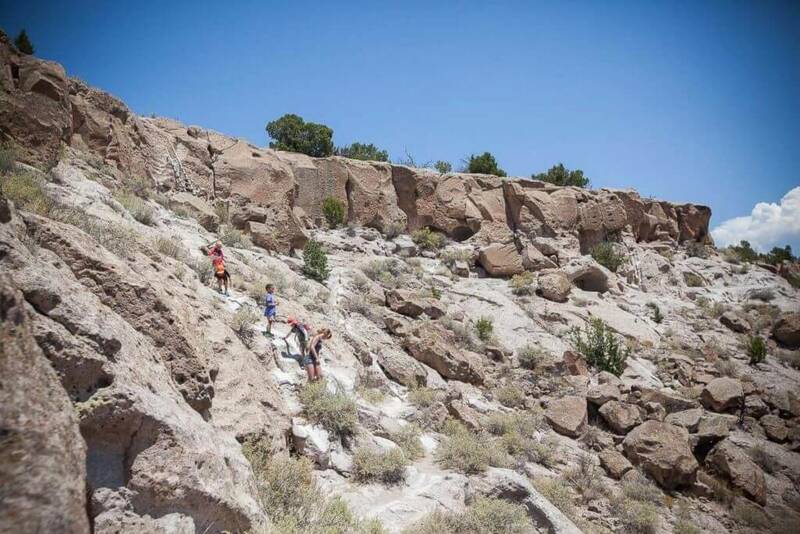 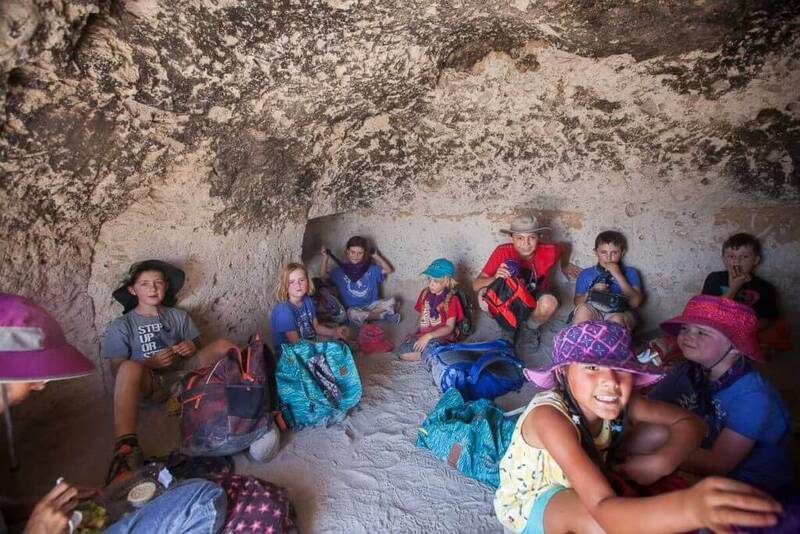 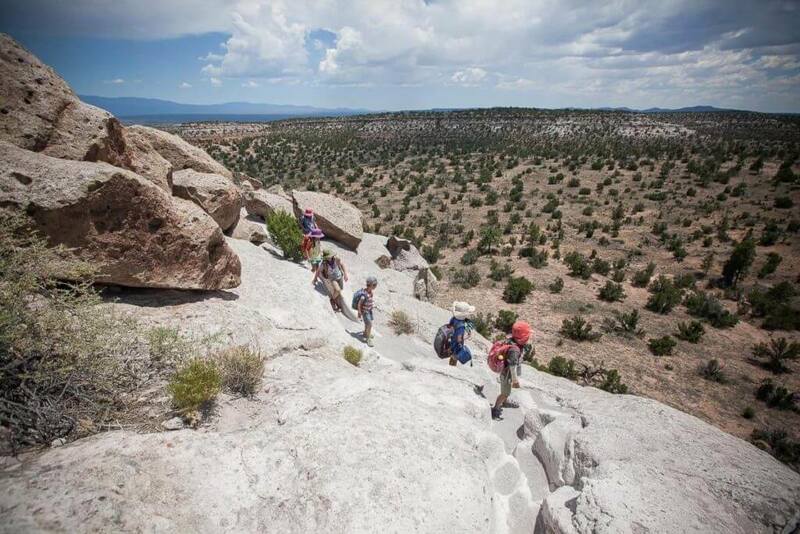 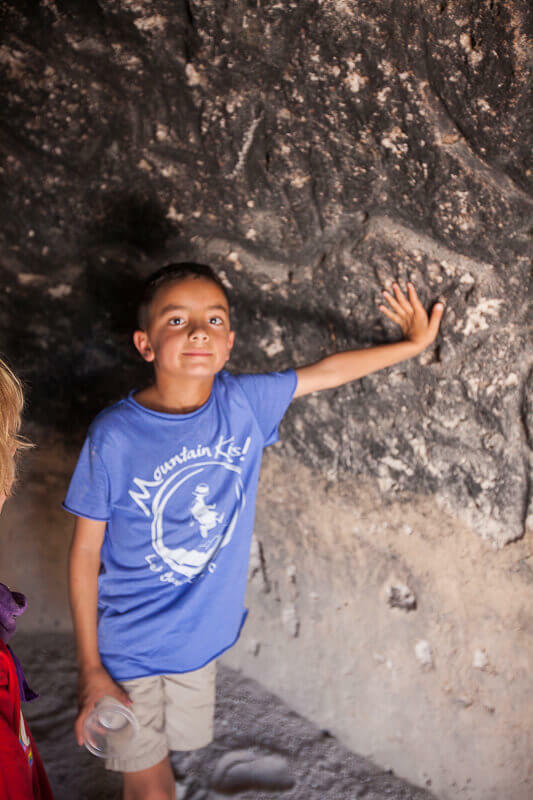 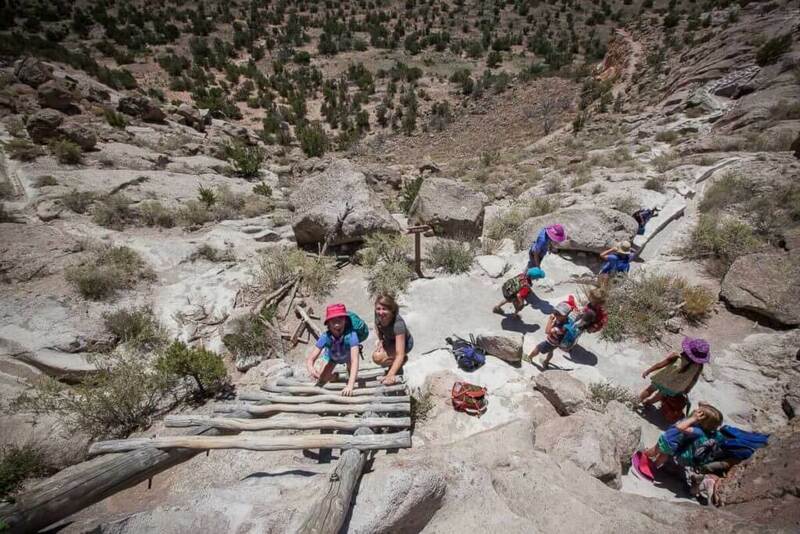 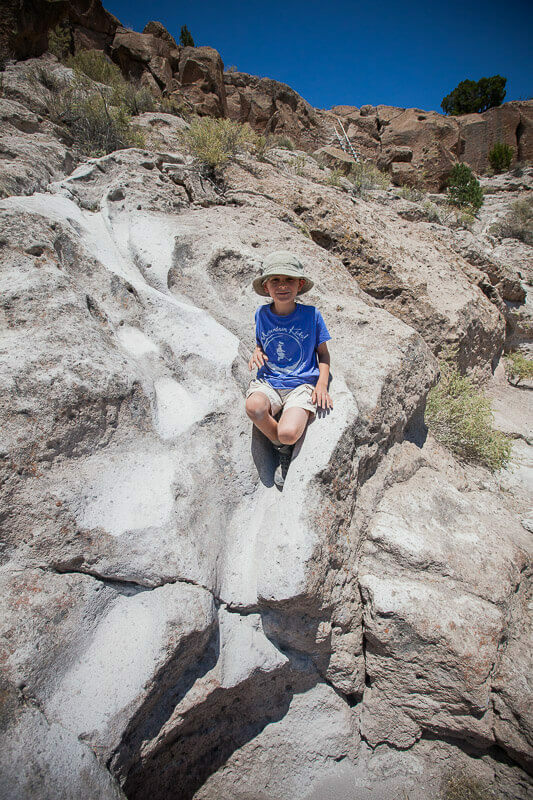 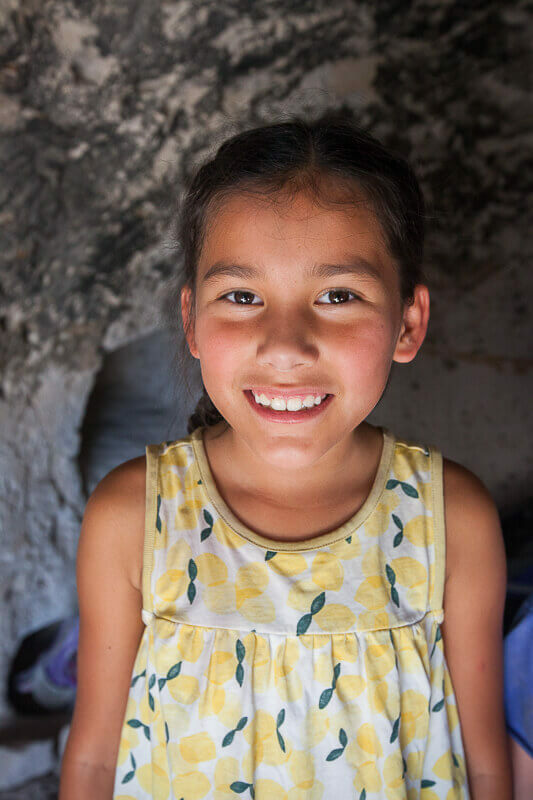 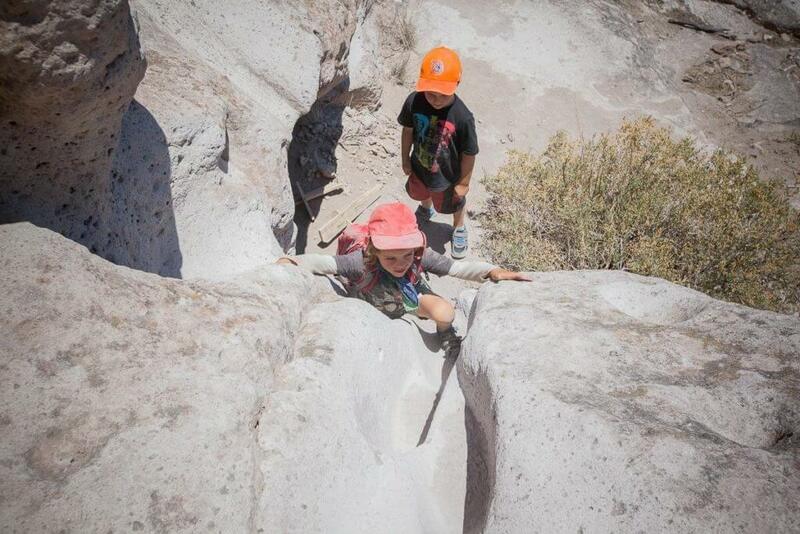 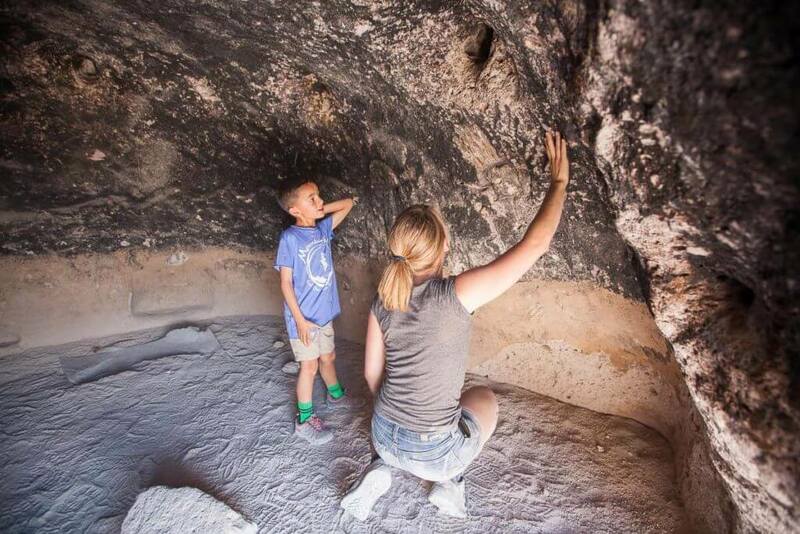 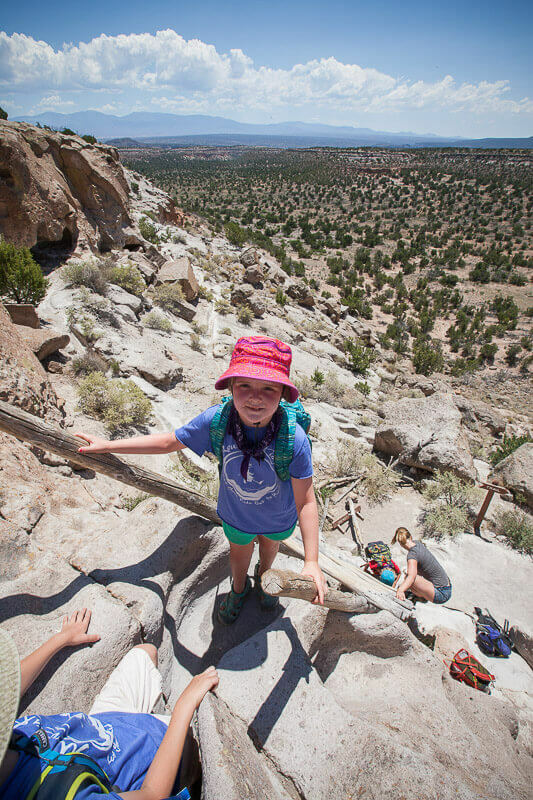 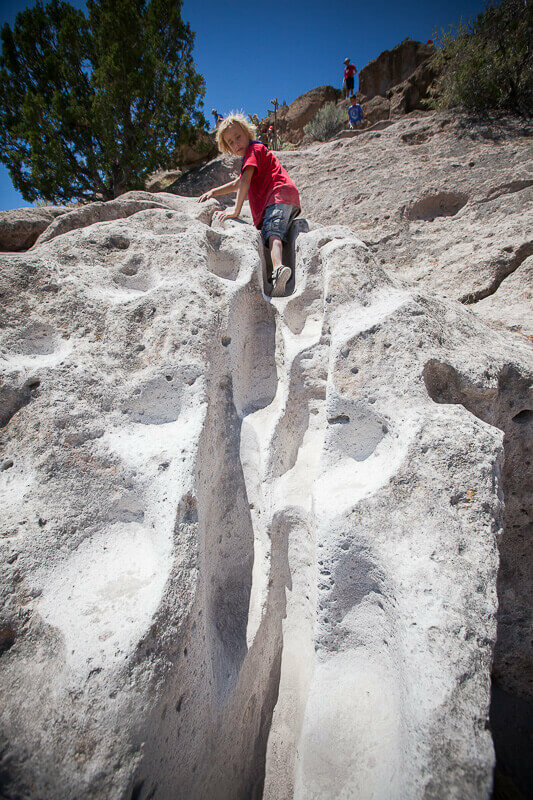 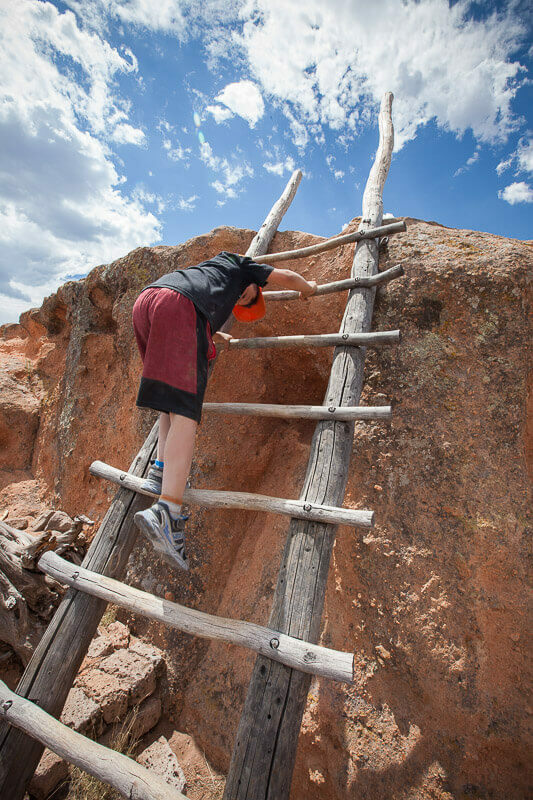 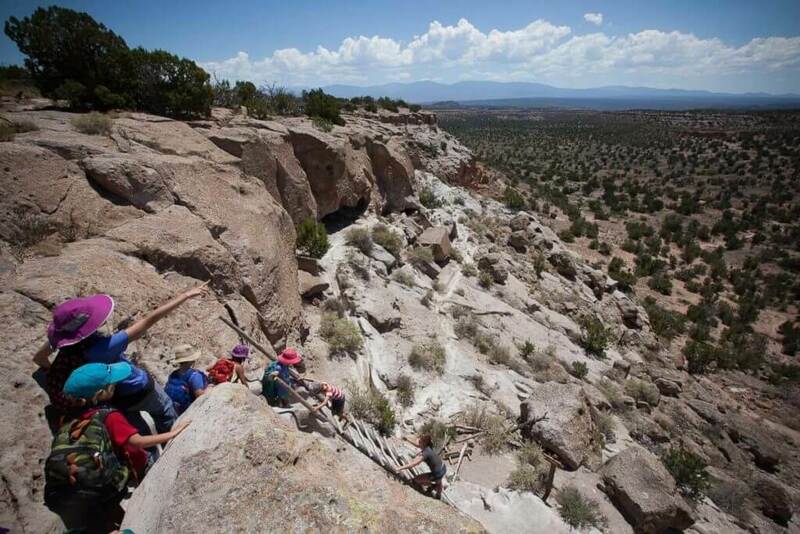 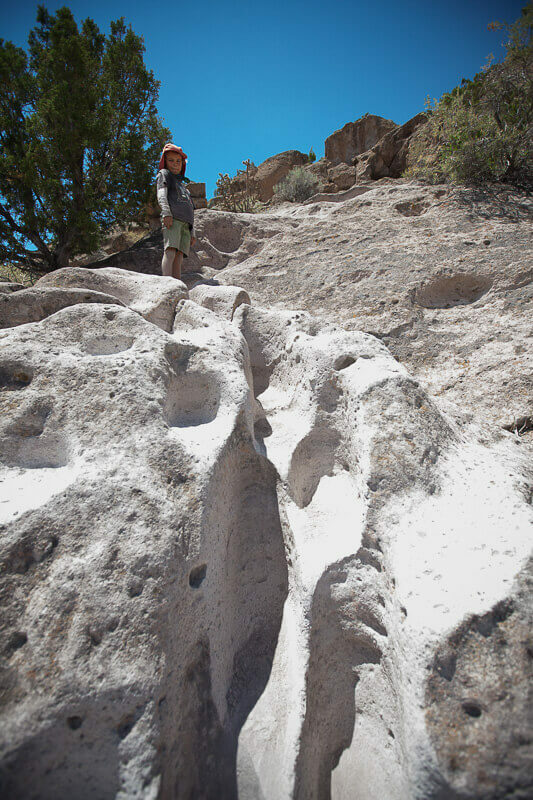 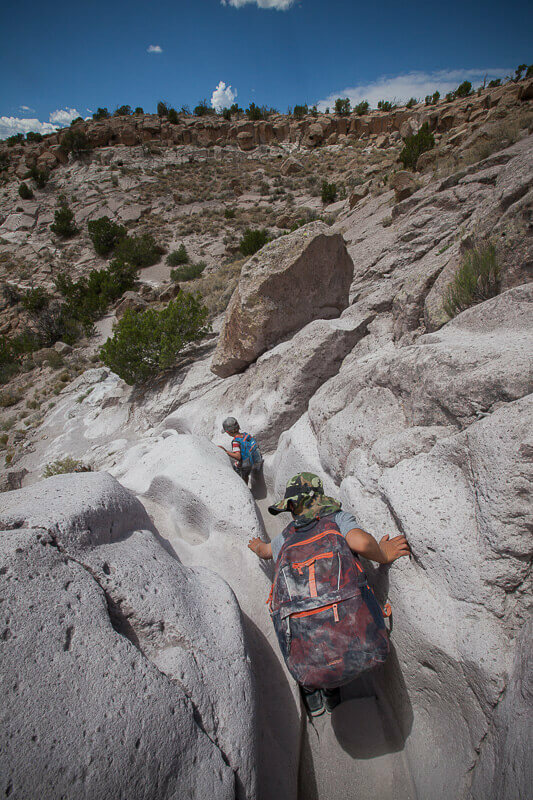 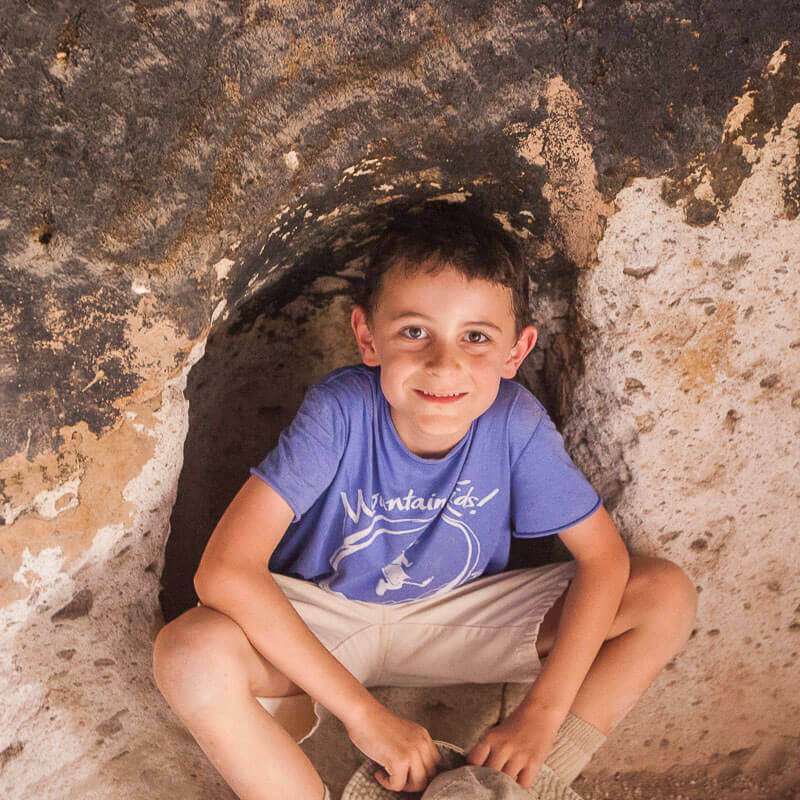 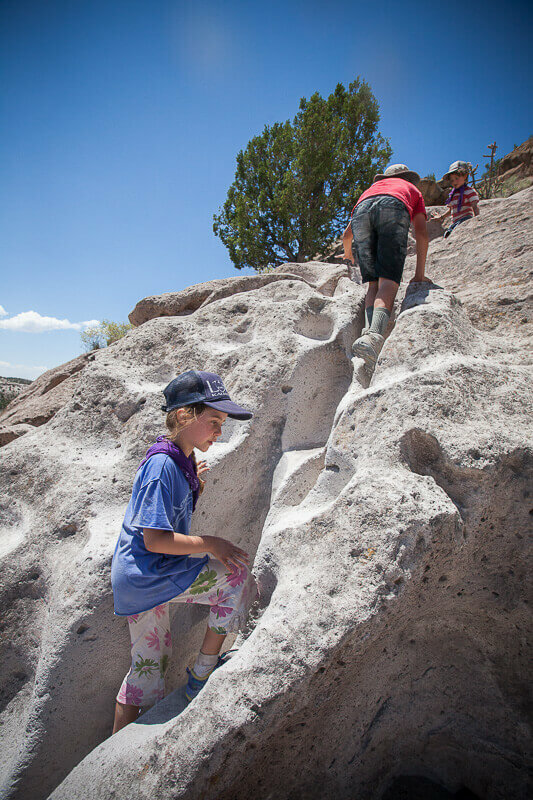 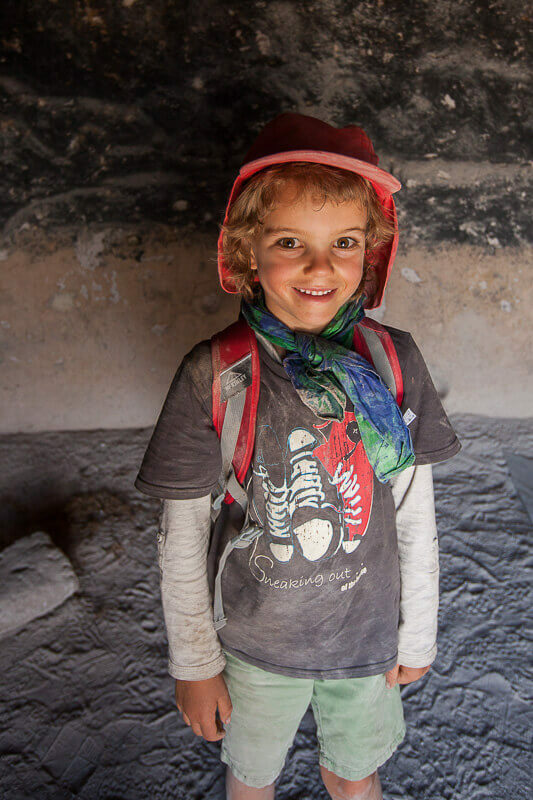 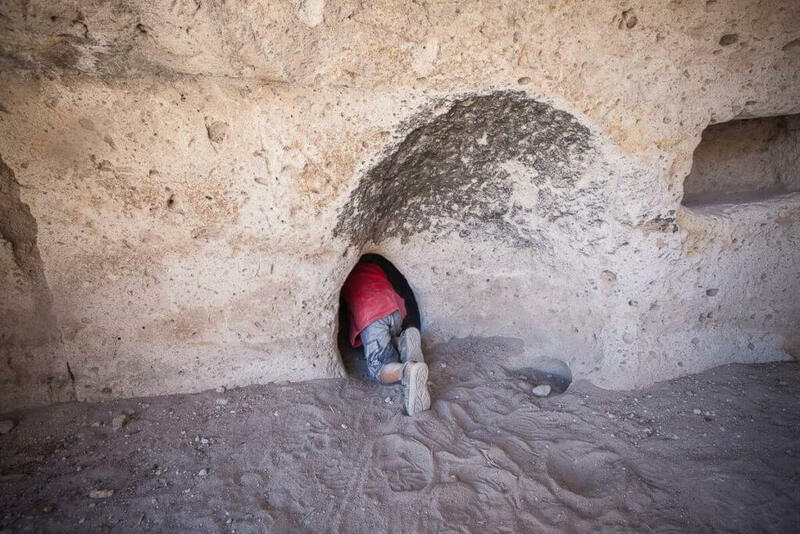 July 6th: Digging into the Past, Tsankawi, Bandelier National Monument | Mountain Kids! 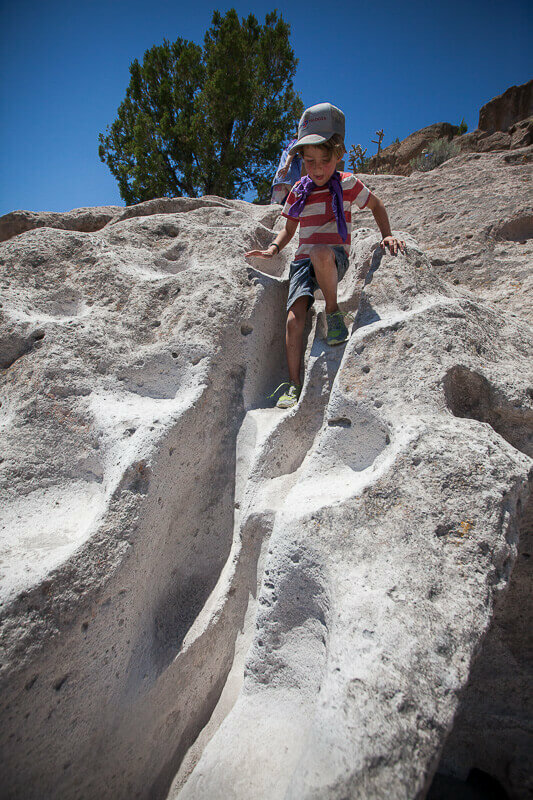 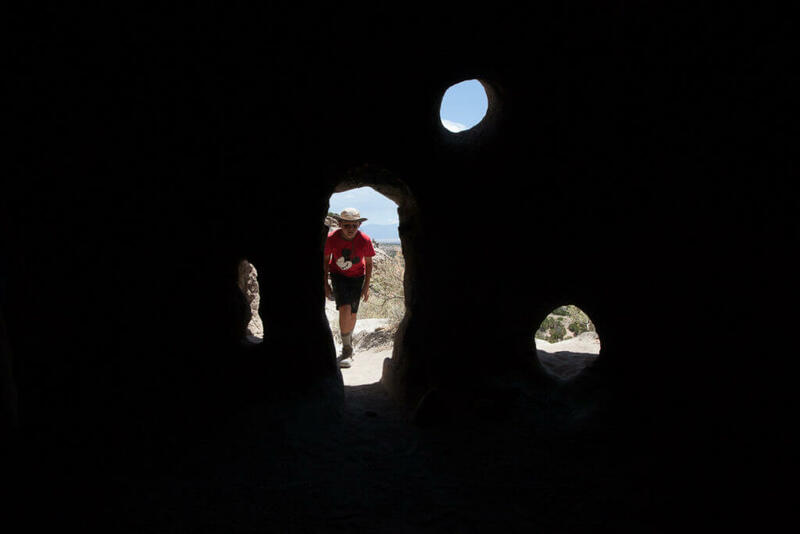 Tsankawi is always a magical place to visit, even on a hot, hot day like today! 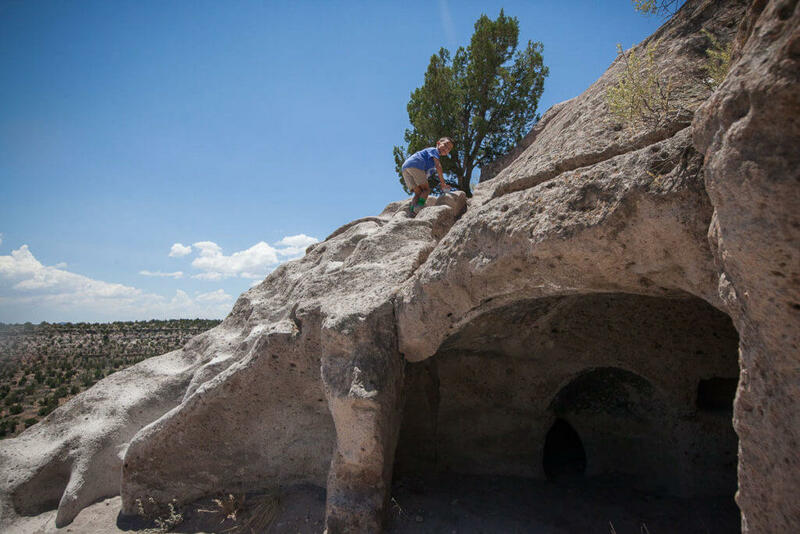 Days like today make us all appreciate water, and it’s importance, especially in light of visiting the former homes of the pueblo people who lived here 600-800 years ago. 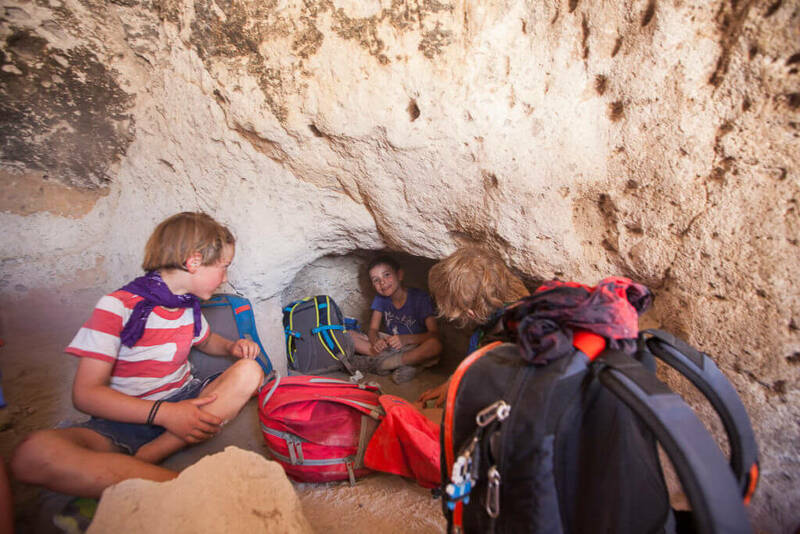 What hardship they must have endured to survive in this raw, beautiful land! 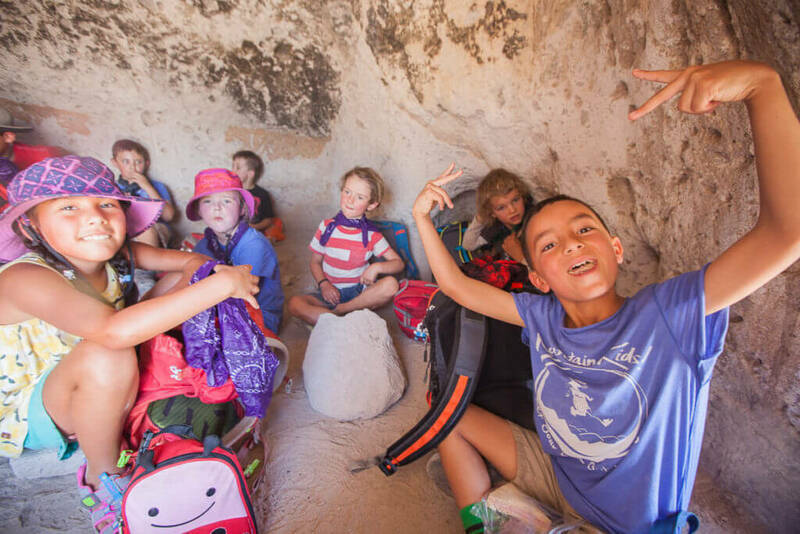 The caves we awesome to cool off in, eat our lunch, listen to a story and some flute music by Katie. 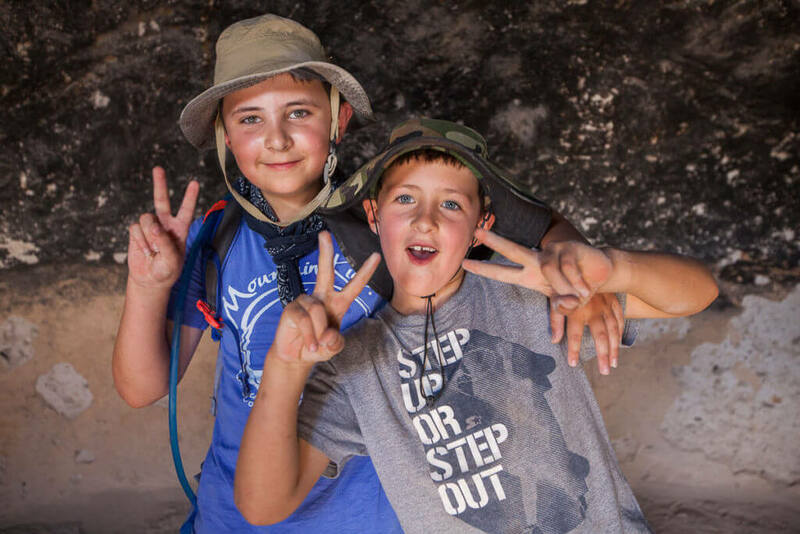 After lunch we had a blast exploring all the caves, the amazing “stairs” and the grooved paths, worn down by hundreds of years of use. 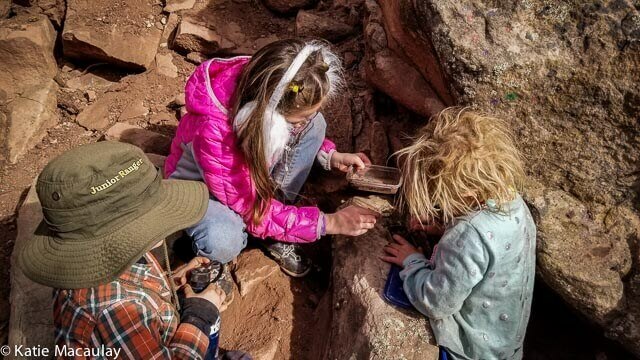 What a great way to finish off our week of Digging into the Past! 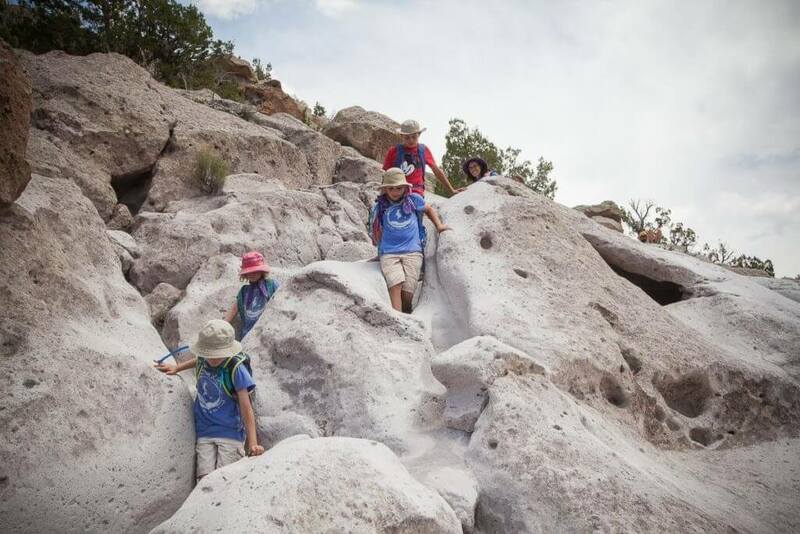 Thanks to a great group a kids for a wonderful time exploring a bit of New Mexico’s fascinating history. 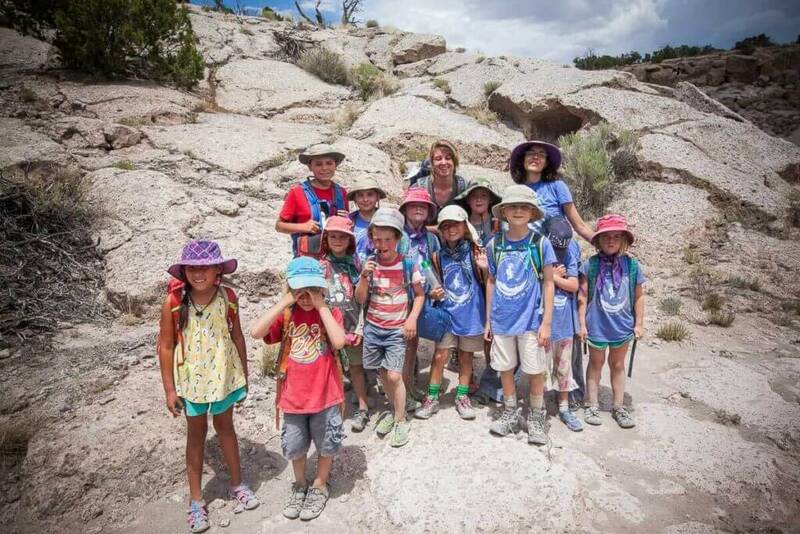 Enjoy the photos of our great group of Mountain Kids! 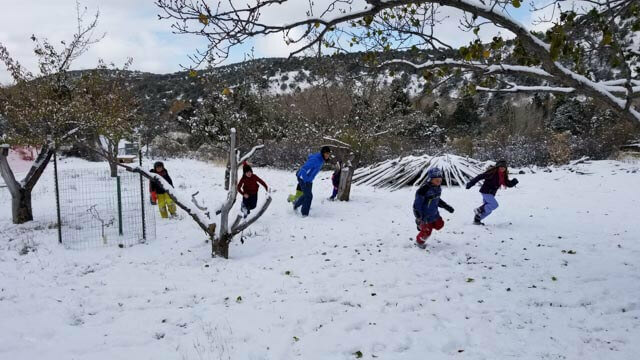 Wild School – Winter Musings: Bears, Eagles, and Snow, Oh My! 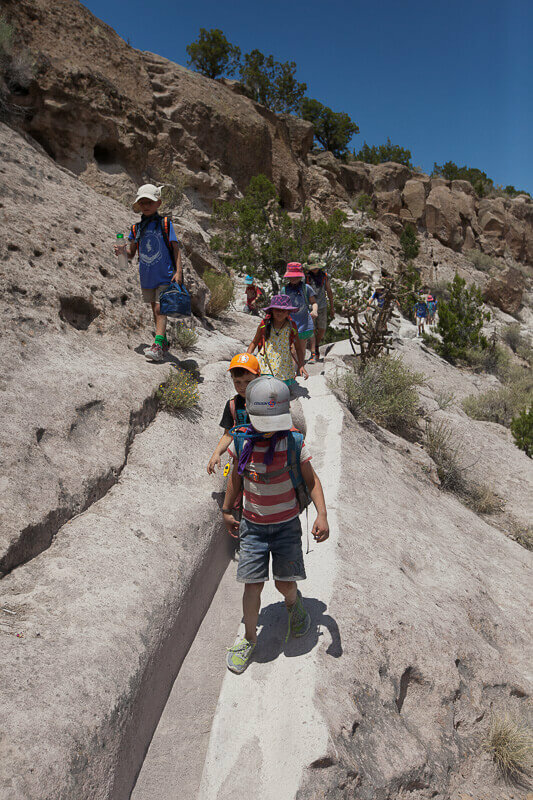 Mountain Kids is a wonderful summer camp option. 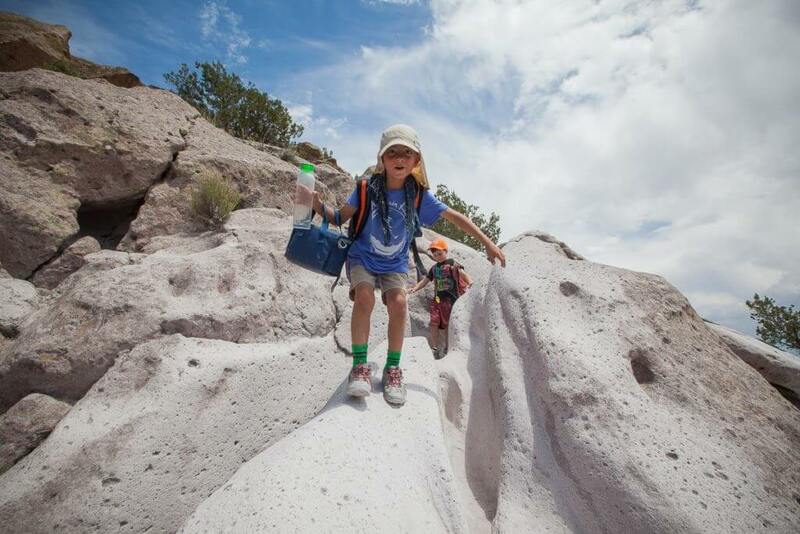 The staff takes great care of all the kids, really looking out for them. 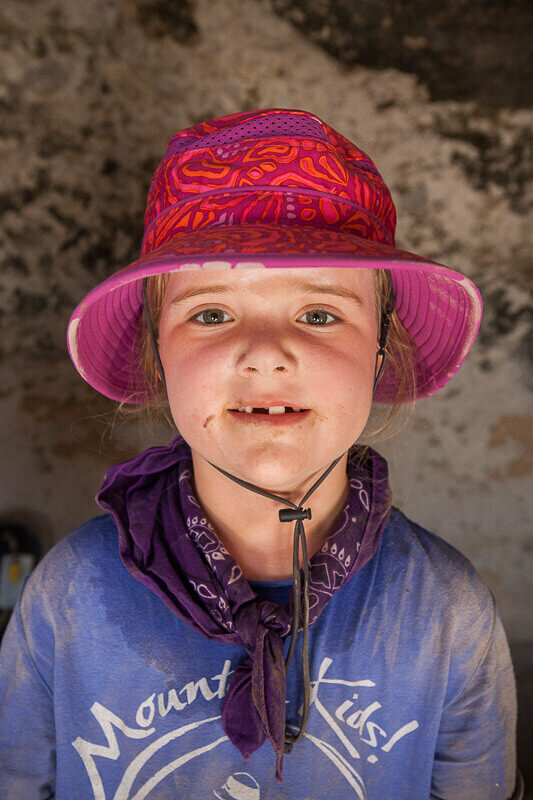 The children come home happy, dirty and tired – what more could you ask? 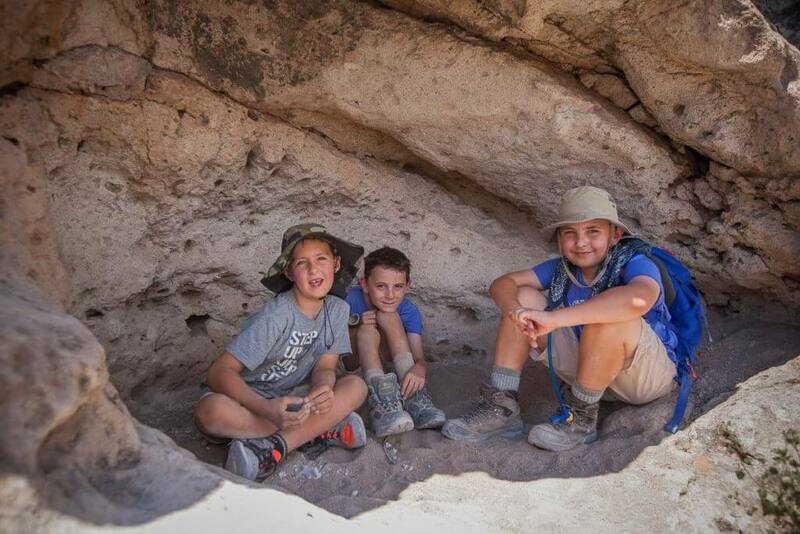 My kids loved all aspects of Mountain Kids camp: circle time/playing in the morning, hiking, talking in the woods/on a trail, singing songs, hearing jokes, being with kids of varied ages (both younger and older than them), and archery was a super plus this year! 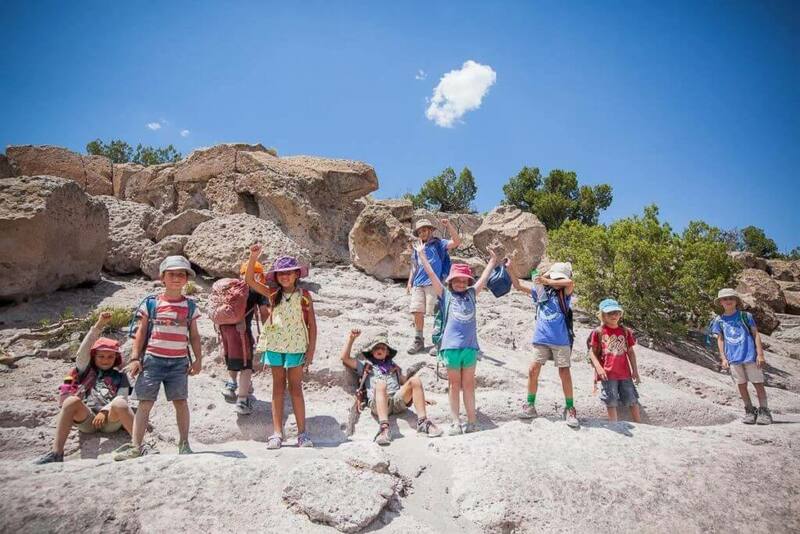 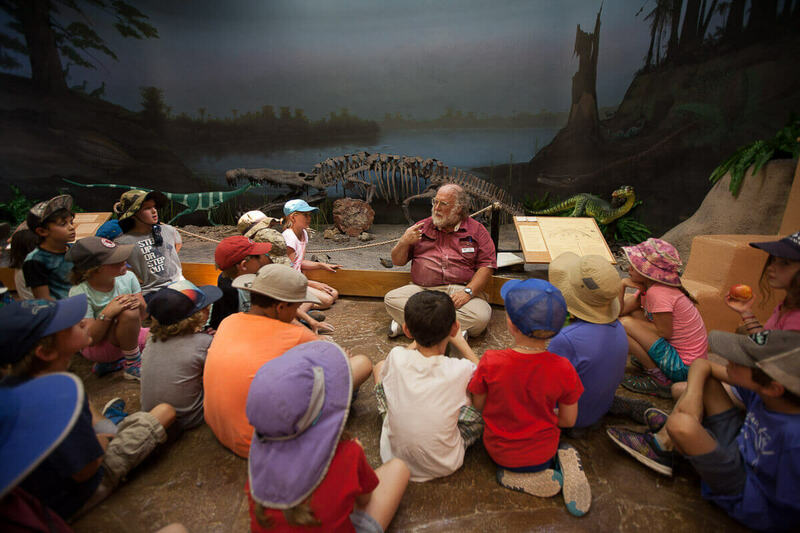 My kids vote this camp as Best of Santa Fe summer camps! 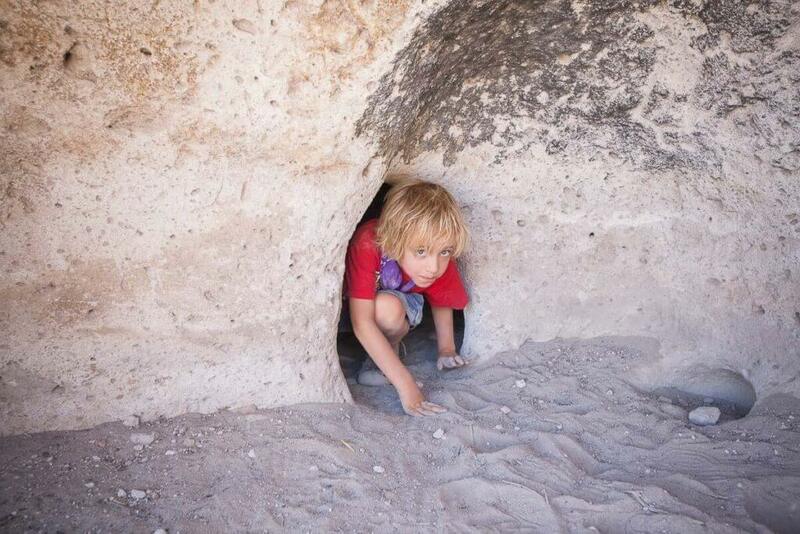 I loved everything. 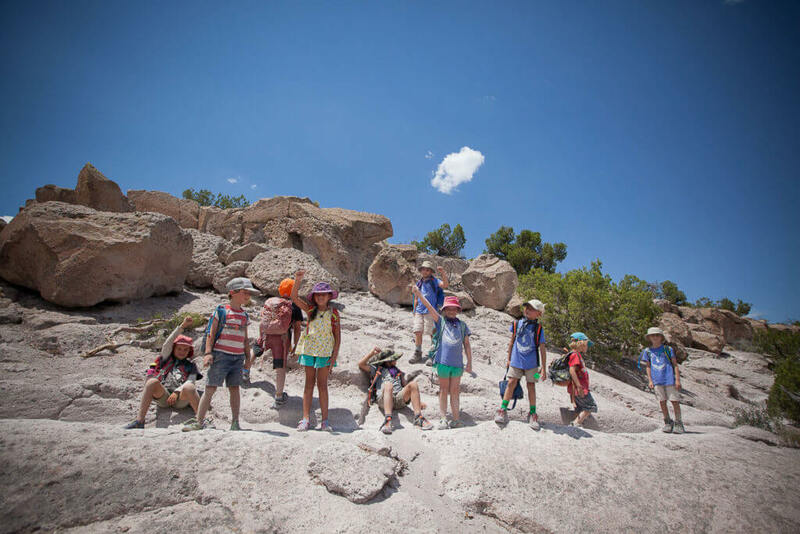 It is the best camp I have ever been to! 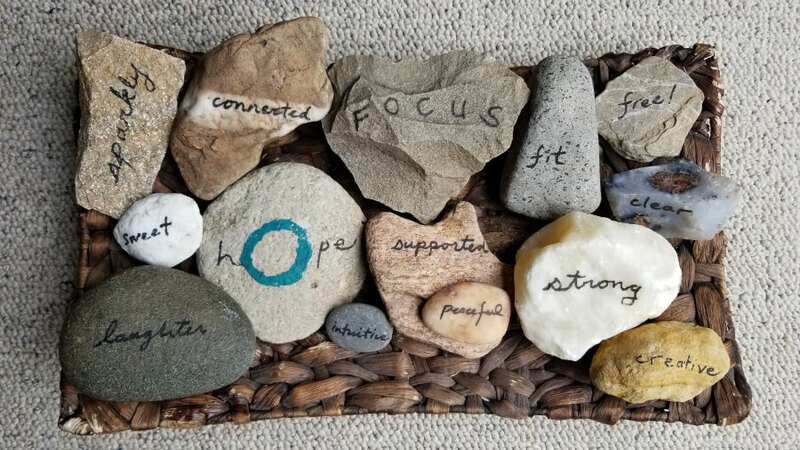 I really liked my counselor Max a lot! 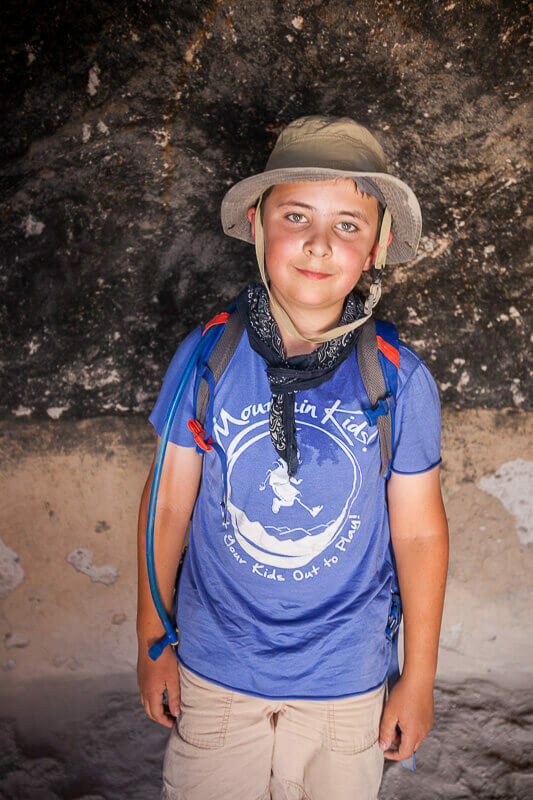 I am really grateful to have found Mountain Kids; I love the philosophy of the camp and it has really encouraged Sam in his love of nature and hiking. 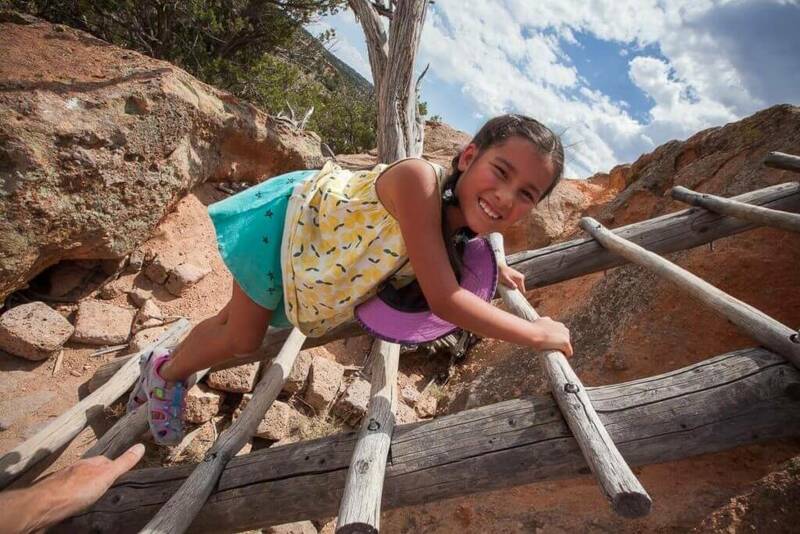 I love the addition of archery. 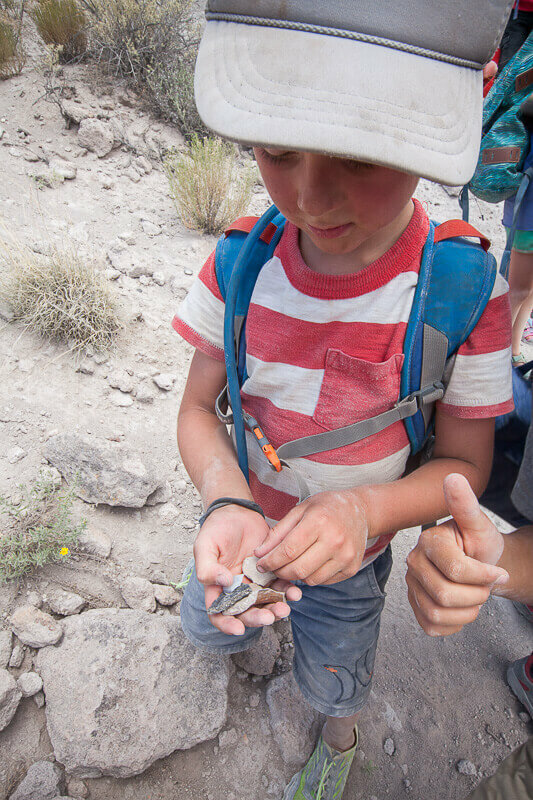 I know our kiddos are younger, but we look forward to the photography week one day. 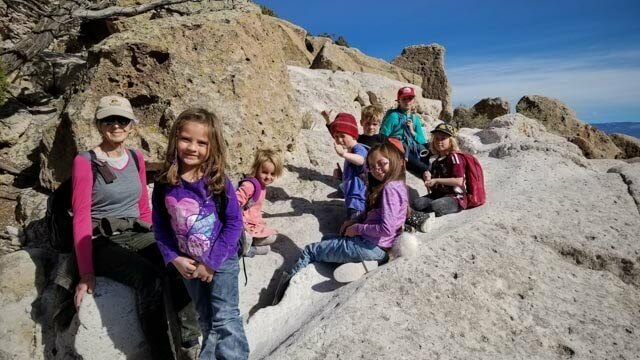 Anything new is fun, and the continual learning….my kiddos amazed their teachers last year by knowing ‘igneous, sedimentary and metamorphic rocks.” Thanks for cultivating their mental and physical skills! 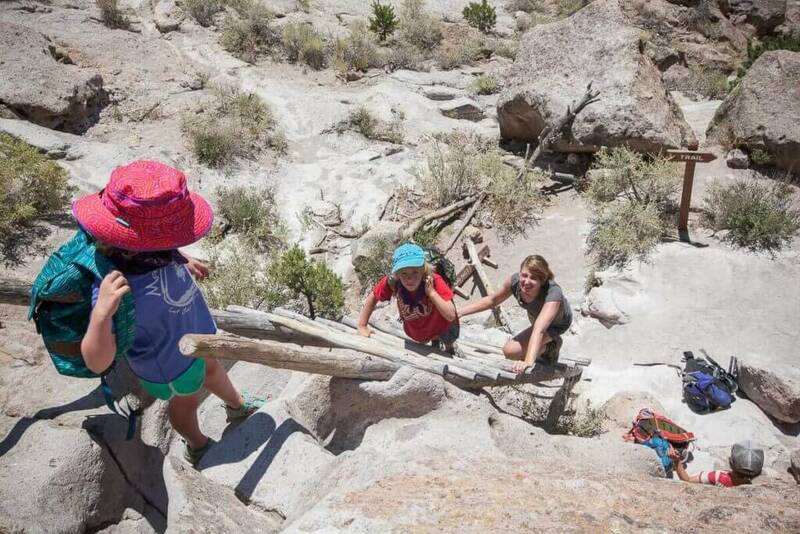 My girls love the super fun, energetic counselors – their parents lack the enthusiasm to get them hiking. 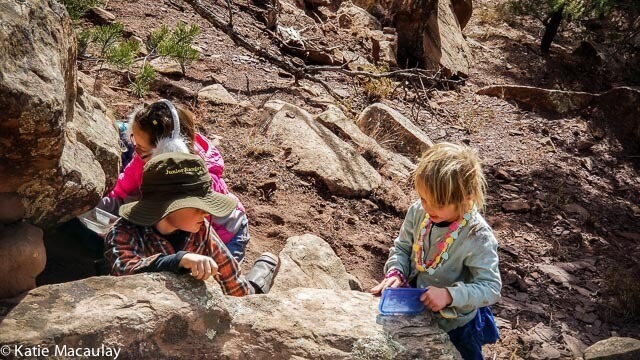 They love meeting new friends while hiking. 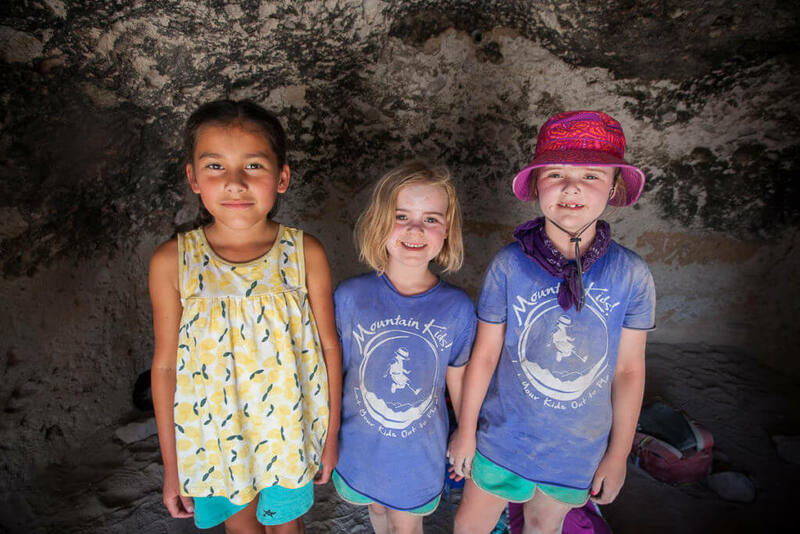 The atmosphere is so friendly, they have an insta-community of friends, even if they just met.